Acer has been putting out some really nice laptops as of late. It seems that the more they produce, the better they are getting. With all of the PC competition out there, I guess it only makes sense that they are producing better devices. 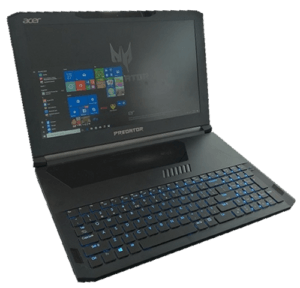 With that, let’s take a look at the Acer Triton 700 – gaming laptop. 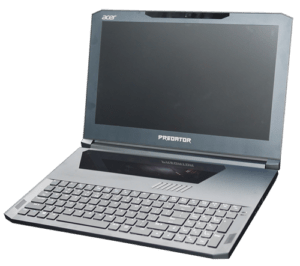 This was one of the very first laptops that was shown to the world as a very thin and yet very powerful laptop. 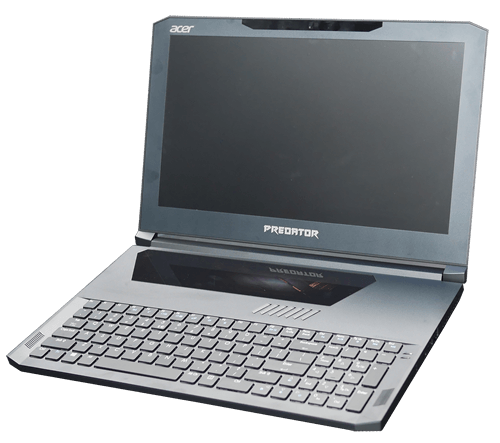 This one of our favorite laptops that Acer makes. Plus, this one is very practical for regular laptop users. This machine is very powerful but it isn’t super obnoxious like most gaming devices can be. It just looks like a simple laptop. The reason that they are able to make it like this is the Max-Q design approach. We have talked about it before but to remind you, Max-Q is how manufacturers focus on energy efficiency and still are able to make laptops thin, powerful, and very quiet. Out of all of the laptops with a GTX Max-Q 1080, this is arguably the best one. 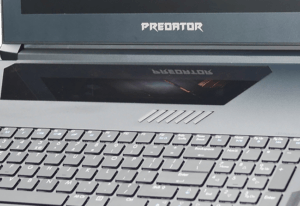 As far as build quality is concerned this device weighs in at 5.4-pounds, 3/4 of an inch thick with a display of 15.4-inches. It has incredible build quality and a full metal design. So that means a metal top panel and a metal bottom panel, a metal keyboard deck. All of it is metal, it’s built to endure. Since it is made of so much metal even being .74-inches thick, it’s still very difficult to find any play or flex in it. As far as color goes, we love it. It’s not really black, it’s a really dark aqua color and looks dope. 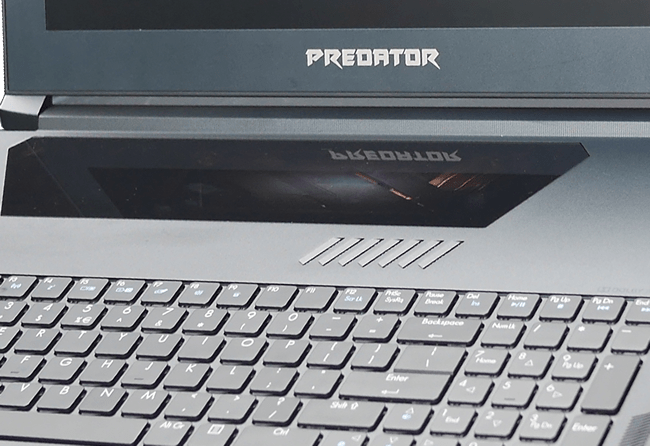 Also, it is free of the red lines that gaming laptops always seem to have for design. It is much more subtle with a bit of blue and the dark aqua color. There are a good number of ports. There are two display outputs (DP+HDMI), Thunderbolt 3, Ethernet, and four USB ports. One of the USB ports is recessed for gaming mice of keyboards that require a dongle to be inserted and since it’s recessed a bit you don’t have to worry about it getting knocked out or broken. If you want to access the internals it’s as easy as removing some screws and the lifting the keyboard off. Just be careful of the two ribbon cables that are connected. There is a pair of NVMe drives, running in RAID 0 and there are 32GB of RAM – two sticks of 16GB. Onboard storage is 512GB of SSD with write and read speeds of 3300 and 2650, respectively. You can upgrade all systems inside if you wanted. The hinge tension is pretty much perfect and you can open the lid with one hand. And when you do open it you’ll see one of the most unique keyboard decks you’ll ever see on a laptop. On the top, there is a glass panel and when the laptop is on you can see the fans spinning. The whole thing is a window. You can kind of see the heat pipes and other thermal stuff. But the main purpose is that it’s actually a trackpad. It’s a smooth glass surface, there is no texture and tracking is good. 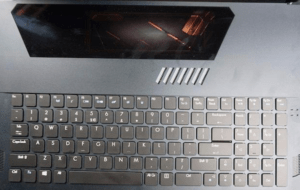 It’s interesting that a trackpad like this that uses a completely unconventional glass surface like this, is still able to use Windows Precision drivers. Tracking is super accurate and it does not skip around and your gestures will still work perfectly. The button clicks are a little different. Left-click is still a simple click, right-click is a double tap, kind of like a MacBook, but there is no tactile response at all. You’re basically tapping on a glass surface, but, it works accurately. The click and drag is a little weird. You have to double-click something to start dragging it around, but, it works well. However, even though it is as accurate as they’ve always been since it’s so different it may take a few days to get used to it. Since it’s a gaming laptop you’ll probably have a mouse attached anyhow. The keyboard is comfortable. It’s close to the front edge because the keyboard has been shifted down a bit to give the thermals a better chance to cool. You may think since it lacks wrist rests that it won’t be comfortable, but in the real world, it’s not bad at all. It’s a mechanical keyboard that feels like it has micro-switches. It has a very short travel with a very short click. If you’re used to a regular mechanical keyboard, you’re not going to be able to switch to this and type at regular speeds, there is a bit of a learning curve. You get fully customized RGB lighting, individual key lighting with tons of colors to choose from. You can go as crazy as you want, or turn it all off. The fan up top also has color options. Performance on this laptop is really impressive. 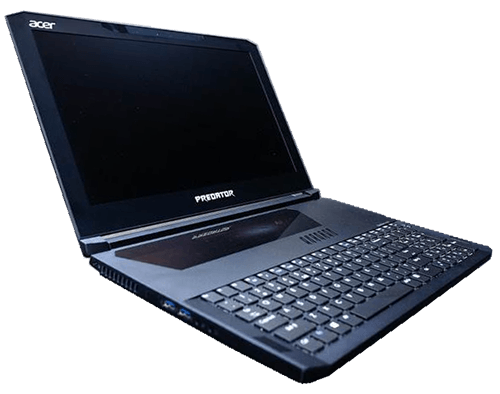 It’s a Max-Q 1080 Kaby Lake i7, 32GB of RAm and because it’s a MAx-Q laptop it runs about 40 decibels when game playing. The most unoptimized and most demanding games run really well on this laptop. The Triton 700 allows you to overclock the GPU. You need to push the fans a little harder to keep it cooled properly, but in Turbo Mode the performances are really good. It actually comes close to a full-fat GTX 1080 laptop. The speakers on this are positioned really well. The stereo separation is on point and they project upwards, one on each side. They are good speakers, they are not excellent but they have decent clarity and lacks bass. The display is really nice. It’s a 1080p, 120Hz panel. It supports G-Sync and when paired up with 1080p, games run smoothly. It’s 310 nits and has an sRGB of 96% and an Adobe RGB of 75%. The battery life on this laptop is probably its weakest point. 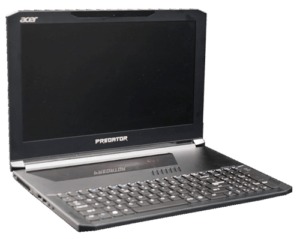 It’s a 54 watt-hour battery and it’s only getting about 2 hours of life with the screen down to 250 nits. Most people that are picking this up aren’t going to be using it for extended gaming session on the road, but if that’s what you’re looking for, it’s not the best option. Remember this starts at just under $3,000USD. It’s definitely not a cheap unit. 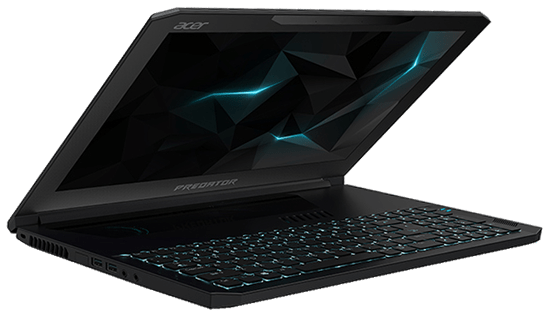 If not for the high price tag the Acer could easily be one of the best selling gaming laptops this year.